When you are using the Map app on the Samsung Galaxy S 5, a resolution of one square mile will work, under some circumstances, to help you get oriented in an unfamiliar place. But sometimes it helps to zoom out to get a broader perspective, or zoom in to help you find familiar landmarks, like a body of water or a major highway. You’ll see a street map both zoomed in and zoomed out. 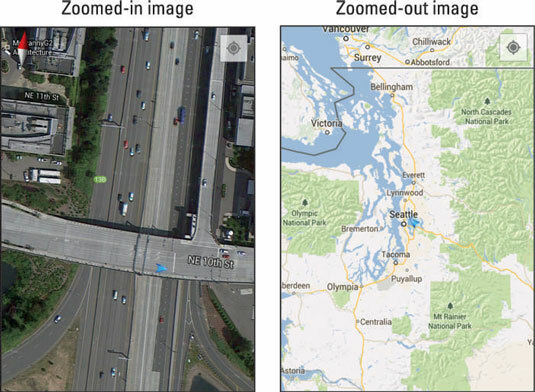 The map on the left is zoomed in in Satellite view. The map on the right is zoomed out in Terrain view. 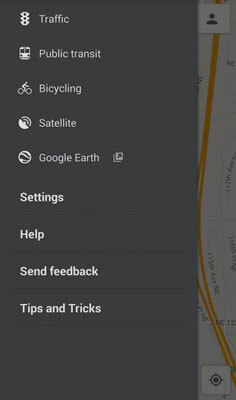 The app gives you the choice of Satellite view or Terrain view by tapping the menu button (the three-horizontal-bars icon) on the bottom-right corner of the map. This brings up a Map menu pop-up.